Welcome to Net Card Games! We feature a collection of the top card games, all hand-picked for quality and maximum fun. Enjoy the card games! So you are having the MOST boring time of your life? Good news! There are card games that will keep you entertained and keep the fun flowing 24 hours a day and 7 days a week. BUT here's the bad news: you can't find your deck of cards! Well, don't worry, who needs a deck of cards when you have NetCardGames.com? NetCardGames.com is your one-stop spot for the best, most challenging, and fun card games found online. Whether you are a seasoned PRO in poker, just starting out your journey in card games mastery, or someone who just wants to kill time and to stave off boredom, we have games that are just right for you! Fun-filled online card games that put nice and exciting twists to classics like Poker, simple and straightforward card games, strategy style games, and everything else in between - you can find it all RIGHT here at NetCardGames.com! And what's even better, especially for the seasoned players out there, is that you can go head to head against card games enthusiasts from other parts of the globe in the quest for the highest score! Our global scoreboards is the perfect place to post your score for the whole world to be in awe. For those who are new to online card games, don't worry! Our top 10 list is an excellent place to get started in the RIGHT direction. Showcasing nothing BUT the best card games, whatever game you pick in from our top 10 list guarantees hours of fun! Even sweeter, it's updated month after month to make sure the latest and top online card games are delivered straight to you! Check out a sample of the games waiting for you inside NetCardGames.com! Intense Card Games That Are Too Fun To Miss! If that's what you're after, then the currently top 1 card game on our list - Governor of Poker, deserves a deep look! 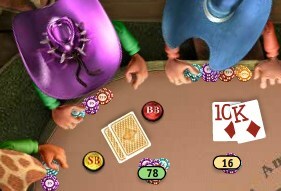 Hands down, this is one of the best poker games online you can lay your hands on. You are NOT just playing for cash in this very intense card game. Engrossing, entertaining - it's just too fun not to try out. It will grab your attention right from the onset and up until the end. And the graphics are really nice too! If you want a card game that will give you a blast and even teach you how to play batter, Governor Of Poker is one of them. Simple and straightforward - our top 2 game: Solitaire is EXACTLY what you want it to be. The graphics are basic, the goal of the game is simple (as it's meant to be), the rules are easy, BUT it's FUN and addictive. Just like the good and old solitaire you came to know. No bells and whistles, just a simple and straightforward card game. For those who love to mix card games with strategic elements, Castle Wars 2 is a game you'll be addicted to. Build a castle that's as high as 20 units and stop your opponent from doing the same or get there first. And here's the twist: you need to play your cards right to do so! All of these and MORE found RIGHT here at NetCardGames.com! What are you waiting for? Log in and have fun.